Atomic bomb over Cerro Solo! Patagonia is showing its true nature: rain, wind, and clouds! All climbing in the range has come to a halt for over two weeks, while the mountains grow whiter. We´ve been climbing around El Chalten when it´s dry, reading many many books, and baking banana bread. Some in town are starting to lose motivation and curse the weather, but hey, what do you expect!? I am currently reading an interesting book documenting a conference between the 14th Dalai Lama, and a group of scientists debating the psychology and nature of mind. Patience is very important in Patagonia! The good news, some climbable weather is coming!! Everyone is more than ready to run into the hills and give it. The current storm has presented somewhat of a dilemma; the ice climbs are melting this time of year, and yet the rock is plastered with new snowfall. Sounds like a true ¨mixed¨ climbing window. AKA cold climbing wearing all clothing and attacking with boots, tools, crampons, whatever helps! Joel will be 26 tomorrow! 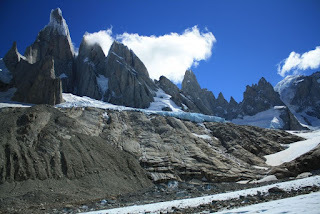 0700 Jan. 24, found Dana ¨Mad Dog¨ Drummond, Wayne Wallace, Leighan, and I scrambling up the chossy lateral morain weakness to the base of El Mocho. El Mocho means ¨flat top¨ and is the most prominant lower feature of the Torre Valley. 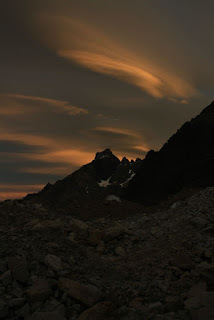 Durring the approach, the high clouds filtered the alpen glow until the morning light was dull and grey. However, the great company lightened spirits and our eagerness grew with each step. 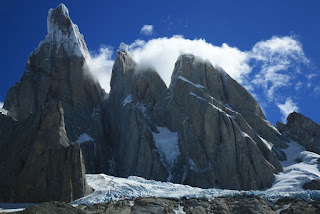 Climbing the left tending flake weaknesses to below the first tower felt natural and the sun played hide and seek with the clouds and adjacent Fitz Roy group. I decided that instead of following my better route finding sense to the perfect dihedral hand crack on the right side of the pillar, I would take the advice of those below and climb the left side of the pillar. I found a flareing Off Width and quickly shifted the rack to the right side and committed to left-side-in stacks, high foot-low foot, heel toeing, which gave way to chicken wings. The expressions and labored breathing/grunts of the remainder of our party was smuggly satisfying from my perch on top of the pillar where two bolts and a stance big enough for four allowed for shoes off, seated auto-block belaying. Above the tower we were confronted with the A2 crux. In reality, a pendulum between two fixed pins was the entrance exam and steep offset cracks the final exam. Mad Dog, whose nickname became evident was earned because of it´s stark opposition to his real disposition, quickly and silently dispensed of the crux. Soon after Wayne followed, I found myself staring at the flexing bugaboo piton, contemplating the freeze-thaw cycles in these austrial Andean spires and how they often spit out iron pitons like the quartz crystals Neil and I spit out of our pasta at high camp. The piton didn´t send me for the ride I had so graphically envisioned, ¨Wayne has me by a few pounds¨ I reasoned, and it held him. The upper ramparts of the Benetiers route (6c A2), were very enjoyable as the sun graced us with it´s presence and the steep headwall gave way to short sections of perfect splitters. The top of the route (summitting El Mocho involves cramponing up the charactaristic mohawkesque wind roll, which we opted not to do in light of the drudgery of the second carrying a pack with boots, crampons, piolets, and ice/snow protection and act we´ll save for larger objectives) lent amazing views of Cerro Torre, Torre Egger, the Fitz Roy group, and 1000m of relief from the diving board feature Dean Potter BASE jumped off of. We were also greated with perfect dissolution pockets in the granite holding gallons of water. A perfect day of climbing with amazing companions. January 1st found Neil and I at Niponino high camp contemplating the weather and climbing objectives. Small, medium, large objectives must be matched to the corresponding length of the window. Neil scoped conditions high on the Torre group while I sharpened crampons. The recent storm cylce had left the medium and large objectives covered in rime ice. We shifted our focus to El Mocho for the third time. We would attempt the Malgoratto route on the right side of the East Face, on the pillars right of Todo o Nada. Simultaneously, Felix and Eric would be climbing on the Benetiers. We split ways at the base and exchanged encouraging communication as we climbed increasingly stimulating terrain. Felix the Cat and E-Rock (aka Fixed Piton and Extra Hard) dissappeared from our view after traversing to the base of the pillar. Neil led steep cracks on the left side of a bombay chimney and then a finger crack dihedral to an interesting OW. My pitch involved resisting a barn door lyeback move to flaring cracks. I finished the pitch with a pin protected traverse to a committing move onto a flake. The top of the first tower was a slightly down slopeing perch with more amazing views. We watched parties on Media Luna and eventually Felix an Eric arriving at the halfway ridge traverse on their route. The upper part of our route wasn´t obvious. While we contemplated which way to go, we spied two climbers quickly descending the wind lip feature. The snow was much to warm to provide good traction even with crampons on. The first person seemed to slip as the snow underfood gave way. Attempts at arresting seemed to slow the fall, but the slope gave way to steep ice and his right crampon caught, catipulting the figure into an uncontrolled rag-doll. I watched in horror as the now tomahawking figure hit the steep ice features again and again with no hope of stopping. Neil covered his eyes. Reality of the situation was felt as a rush of adrenaline and the associated stomach cramps as blood was shunted to alert my senses. Our perfect day of climbing shattered around us and we began preparations for rappeling. We quadrouple checked ourselves, well aware of implications of letting the mind wander to the fallen climber. We alerted Felix and Eric, who quickly abandoned their objectives and began rappeling. It took us four hours from the time of the accident to rap, descend to the base of the slabs and then climb up to the base of Media Luna. What we found at the accident site was better than I had imagined. The fallen climber was walking with the help of his partner and one other person. Blood caked his face from a laceration just above his left eye. My gaze fell to his right foot, which lacked a boot and was obviously swollen and distorted. Eric, an EMT, and my own training as a Wildness First Responder, took over. We arranged a padded spot to help the patient into a seated position and then fully reclined. Eric did a head to toe exam and ruled out other injuries that may be masked by the ankle. We learned that the patients partner had run down to Niponino after finding his parter alert and oriented. Luckily, the pair had a raidio and were able to alert the Parque authorities. A columbian climber at base camp had accompanied the partner back the the accident site and administered pain meds. We splinted the ankle, imobilized the knee, and began constructing a litter out of 8 ski poles, lots of tape, cordelette, backpacks, and foam pads. Meanwhile, the four climbers on Media Luna rappelled, including the assistant medical director at the hospital in Chalten. Ten climbers responded to the initial call out. We spent the next five hours lowering and carrying the patient over some of the worst terrain imaginable for a rescue. At times we were in a controlled slide with microwave sized boulders rolling alongside us. Every fifteen minutes we would find a flat spot and rest. Our backs, biceps, and calves recieving the brunt of stooping over to lower the litter over complex terrain. By midnight we found a perfect bivy site and sent two to retrieve tent, sleeping bags, and food from Nipo. We made the patient comfortable, already having surrendered all our warm clothing. 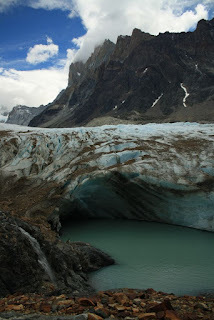 Word from Chalten was that a recue team was assembling and leaving town at midnight. That would put them at our position around 0800. The first responders retired to Nipo for a late dinner and exhausted sleep. We woke the next morning to 25 capable rescuers moving through camp on their way to the bivy site. I was relieved to not have to carry more. The rest of the rescue was conducted quickly with a new aluminum litter with front and back shoulder carrying capacity and two very knowledgeable Italian pro-rescuers. We waved them on and began slowly stretching out sore muscles and packing for the return trip to town.